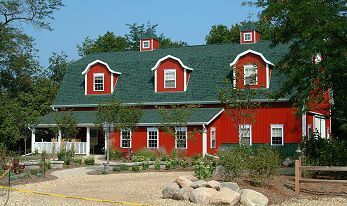 TimberCreek Bed & Breakfast is a gated, sophisticated country retreat on 25 acres. It is situated at the end of a 1/4 mile lighted, winding lane in a secluded meadow surrounded by trees and a stream. It is the ideal setting to escape fast-paced everyday living and relax, recharge, and reconnect with each other. The interior is decorated in an English Cottage decor. There are six suites with hardwood, brick, and tile floors, pickled white wood ceilings, skylights, columns, extra wide trim, fireplaces, private sitting areas, knotty alder beams and cabinetry, upscale furnishings, artwork, oversized beds, a Jacuzzi, and much more. Outside, guest will find two stone patios tucked in the landscaping with wrought iron tables and chairs, wood rocking chairs, a sunset cove, and plenty of terrain for walking. TimberCreek may also be reserved for family gatherings, business meetings, strategy sessions, and church retreats. It is the perfect place to promote new ideas and creativity.